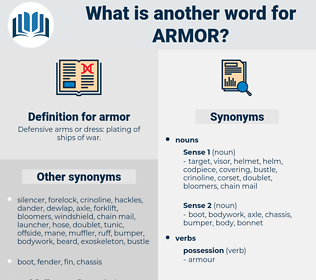 What is another word for armor? Defensive arms or dress: plating of ships of war. offense, offensive, assault, attack, aggression.
" Armor," the German said. I said I would never wear armor after this trip. 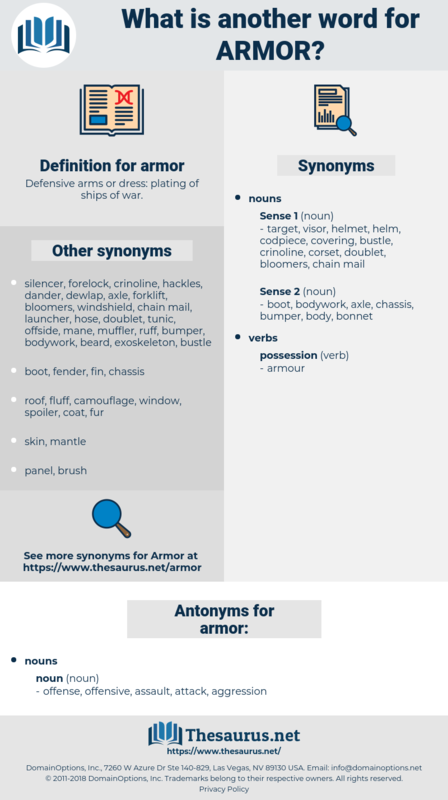 armoury, armory, armoire, armeria, arenaria, armourer, armorer, air hammer, armour, armer. cataphract, shield, body armor, suit of armor, buckler, Suit Of Armour, Body Armour, coat of mail. protection, protective covering, protective cover. equip, fit out, outfit, fit.